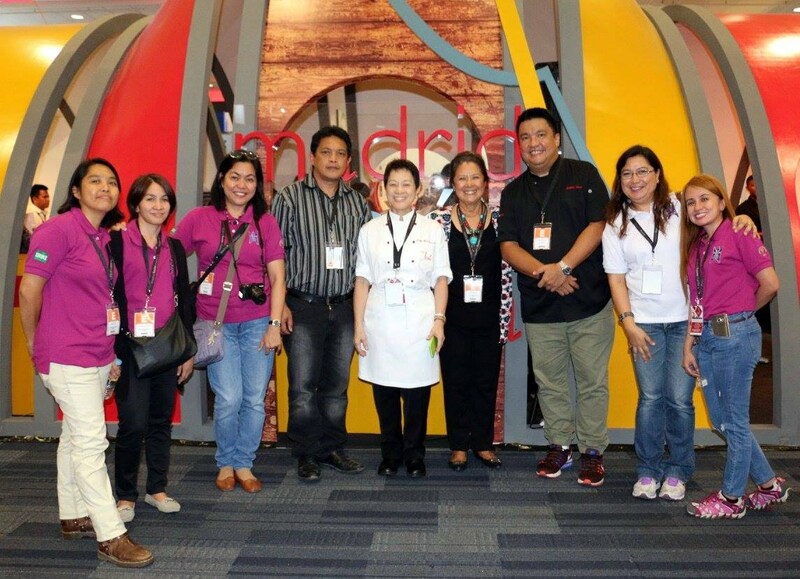 PASAY CITY, Philippines, 7-9 April—The heirloom rice of the Cordillera Region again attracted international attention at the world’s most prestigious gastronomic congress, the 2016 Madrid Fusión Manila. 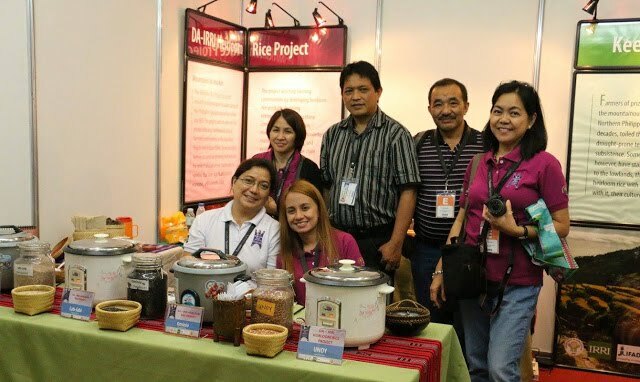 This is the second time HRP participated in Madrid Fusión Manila and, like during the previous congress, the pigmented rice varieties attracted the attention of local and international audiences. 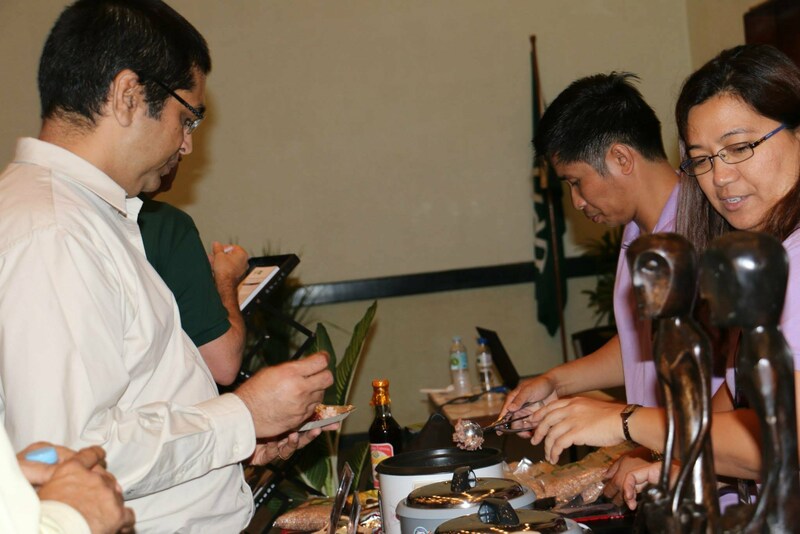 Among them were local and international restaurateurs who showed keen interest in including heirloom rice in their menus, chefs who are on the lookout for new ingredients, and heads of food companies who are seeking to diversify their products. The rice likewise drew food bloggers and writers, health advocates, government representatives, students, and senior citizens. On the second night of the Madrid Fusión, Robby Goco, the acclaimed executive chef of Cyma and Green Pasture restaurants in Manila, prepared a rice salad using Chorchor-os and a parsley black salad using Ominio for his cooking demonstration. Meanwhile, Chef Jessie Sincioco, president and CEO of the 100 Revolving Restaurant and Chef Jessie Rockwell Club, prepared his versions of the ginataan and kalamay sa latik using jekot, and risotto using chong-ak. Both chefs have been passionately promoting heirloom rice in their restaurants. Syndicated article from the IRRI News site, as written by Ms. Sharlene Santos-Peralta. Check the following links for the photos of the event, at our Facebook page. BANAUE, Philippines—Farmers in the Cordilleras are now setting their sights at linking with dealers interested in marketing and promoting heirloom rice varieties locally and abroad. Municipal and provincial local government units (LGUs), farmers in the Cordillera Administrative Region (CAR), and a team from the Heirloom Rice Project (HRP) met in Banaue, Ifugao, 16-17 March. They discussed business plans, market linkages, Geographical Indication (GI) registration, and other market-related concerns as the project moves forward into the third and final year of phase 1. Participating farmers from Ifugao, Benguet, Kalinga, and Mountain Province provided comments on and suggestions to their specific business plans that contain detailed information and market strategies. The farmers and local champions started putting together these business plans in December 2015 under the guidance of the Agribusiness and Marketing Assistance Division of the Department of Agriculture (DA)-CAR and the International Rice Research Institute (IRRI). This activity is part of HRP’s component on linking farmers to the value chain. Under this component, heirloom rice farmers are being trained to understand the markets, within and outside the region and to expand their market base. The farmers are also being empowered to enter into transactions and promote greater equity in their trading partnerships. The GI registration for heirloom rice varieties was also tackled. The group discussed the critical dimension of using the traditional names of heirloom rice varieties for registration. The GI tag ensures that only registered users residing within the geographic territory are allowed to use the product name. The GI tag also puts premium importance on particular traits linked to specific cultural origins. 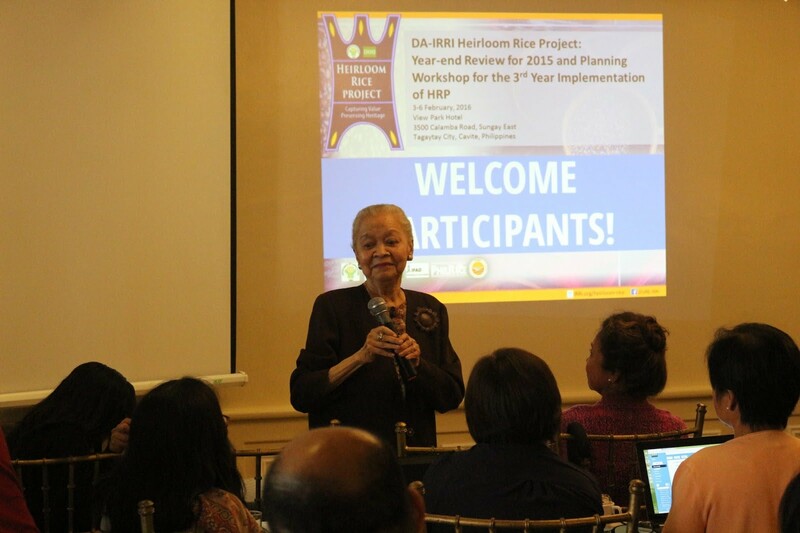 Dr. Casiana Vera Cruz, project leader, agrees that the marketing of heirloom rice should significantly consider the unique characteristics of each variety. 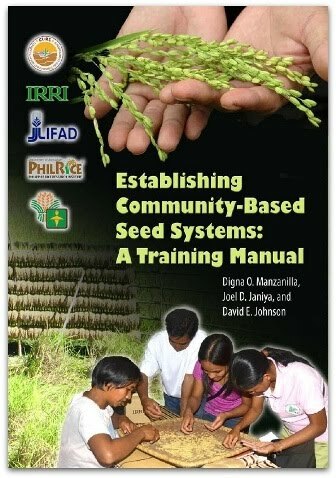 The HRP hopes to create a sustainable and thriving heirloom rice industry for future generations through its partnership with the farmers and the continuous collaboration with the DA-CAR (led by Dr. Magdalena Manawan, chief of research, and Virginia Tapat, chief of the Regional Operations Division), the Philippine Rice Research Institute, and IRRI. 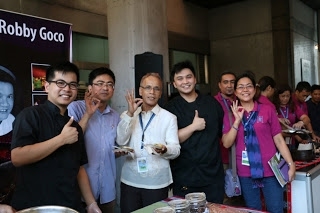 LOS BAÑOS, Philippines—Heirloom rice varieties from the Cordillera Region are being featured through 4 March in a public exhibit promoting outstanding agriculture technologies and products at the headquarters of the Philippine Council for Agriculture, Aquatic and Natural Resources Research and Development (PCAARRD). 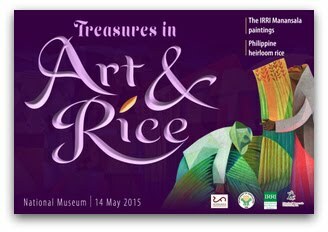 “The exhibit is giving the public a chance to learn about our traditional heirloom rice varieties and to support the Heirloom Rice Project (HRP), which is helping farmers in the Cordilleras,” explained Paul Hilario, curator of Riceworld Museum at theInternational Rice Research Institute (IRRI). The exhibit features a rice-tasting activity in which participants can experience the superb cooking quality of the heirloom rice varieties. HRP is a joint initiative of the Philippine Department of Agriculture and IRRI under the country’s Food Staples Sufficiency Program. 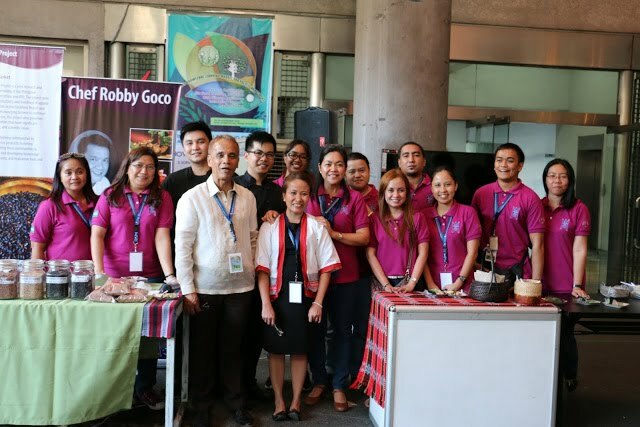 The exhibit, Strategic Industry Science & Technology Program for Agri-Aqua Growth (SIPAG FIESTA), is showcasing the best products and services that Philippine agriculture has to offer. 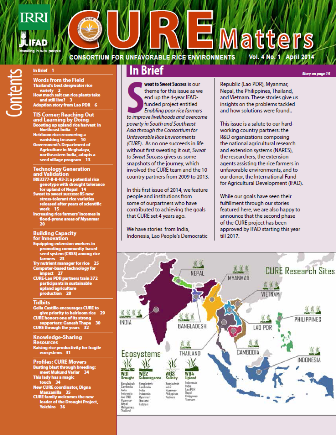 Syndicated article from IRRI News site, as written by Ms. Sharlene Santos-Peralta. TAGAYTAY CITY, Philippines—Soon to begin its second phase, the Heirloom Rice Project (HRP) will further help traditional farmers of the Cordillera Administrative Region (CAR) and North Cotabato work more closely with the local and export markets. With strategies to improve farmers’ livelihoods and increase their incomes through heirloom rice production and marketing, the HRP team—led by Dr. Casiana Vera Cruz, senior scientist at the International Rice Research Institute (IRRI), and Dr. Digna Manzanilla, IRRI social scientist and coordinator of IRRI’s Consortium for Unfavorable Environments—looks forward to enhancing the value chain where farmers and producers can derive social and economic benefits. 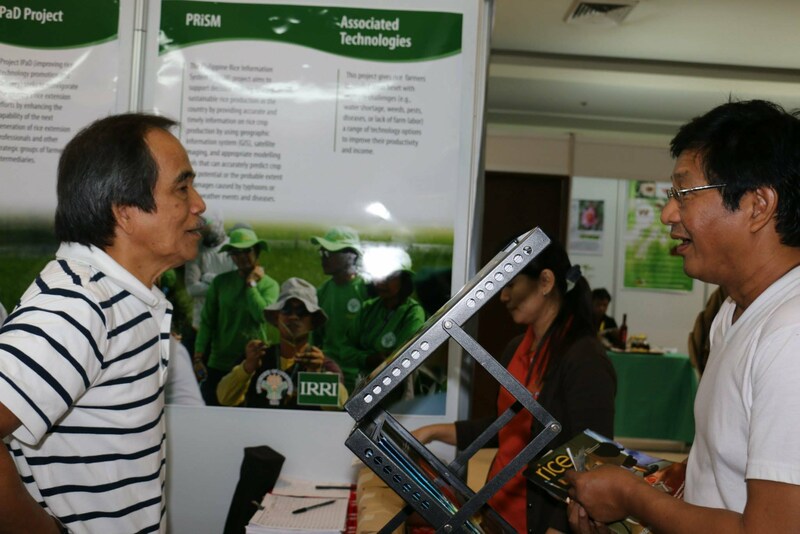 Dr. Gelia Castillo (photo), national scientist and IRRI consultant, and Mr. Edmund Sana, consultant to the Philippine Department of Agriculture (DA)’s Food Self-Sufficiency Program, provided guidance. The unique and complex nature of the project make it an interesting endeavor to undertake, according to Castillo. She challenged the HRP team to remain focused on the vision of seeing that rice farmers improve their lives through heirloom rice. The HRP is a collaborative undertaking of the DA and IRRI to help smallholder rice farmers in Benguet, Ifugao, Mountain Province, and Kalinga and upland farmers growing traditional varieties in the Arakan Valley in North Cotabato. During phase 1, it has been aiming to characterize and understand the diversity of heirloom rice varieties as well as to help link the farmers who grow these rice varieties with both domestic and export markets. In the annual review on 4-5 February, the project team, partners, and other stakeholders discussed accomplishments in 2015 and plans for phase two. Achievements in 2015 highlighted during the discussion included characterizing varieties, mapping sites using geographic information system software, and strengthening the link between farmers and markets. Moreover, the project was able to determine the unique traits as well as the grain and nutritional qualities of heirloom rice varieties. Most of all, the HRP team developed a brand concept for marketing heirloom rice. The review also provided opportunities for the collaborators to harmonize efforts to find solutions to problems confronting smallholder heirloom rice farmers. Representatives from the four CAR provinces and North Cotabato shared their plans of action for 2016. Eighty participants from DA, DA-CAR, state universities and colleges, IRRI, the Philippine Rice Research Institute, the Industrial Technology Development Institute of the Department of Science and Technology, the Intellectual Property Office of the Philippines of the Department of Trade and Industry, and the National Commission for Indigenous Peoples attended the annual review. On the 14th of January 2016, the Heirloom Rice Project had its activity entitled "Market encounter: Farmer leaders meetup with the potential market linkages". Stakeholders in the project and potential private sector buyers converged today at IRRI Headquarters to primarily explore market opportunities. 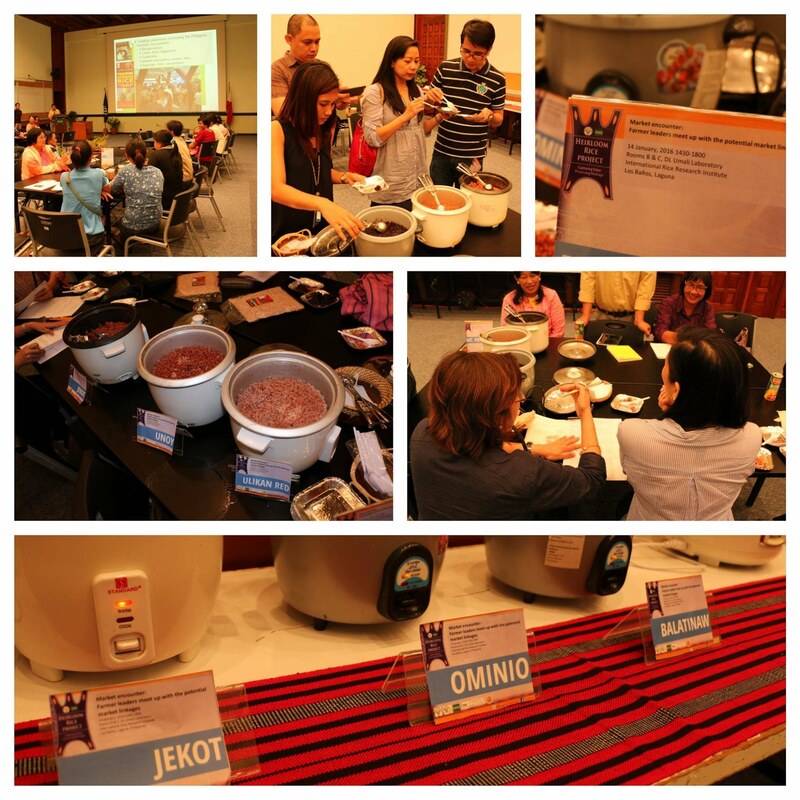 They also got to taste 12 yummy Heirloom Rice varieties. "Plus, we were able to support local farmers and help our local market because we're using what's available locally and don't needo import from other countries," he explained. Syndicated article from IRRI News site, as written by Ms. Paula Bianca Ferrer. On 12 September 2015, the ASEAN Ministers of Agriculture and Forestry (AMAF) visited IRRI as part of their 37th meeting as held in the country. 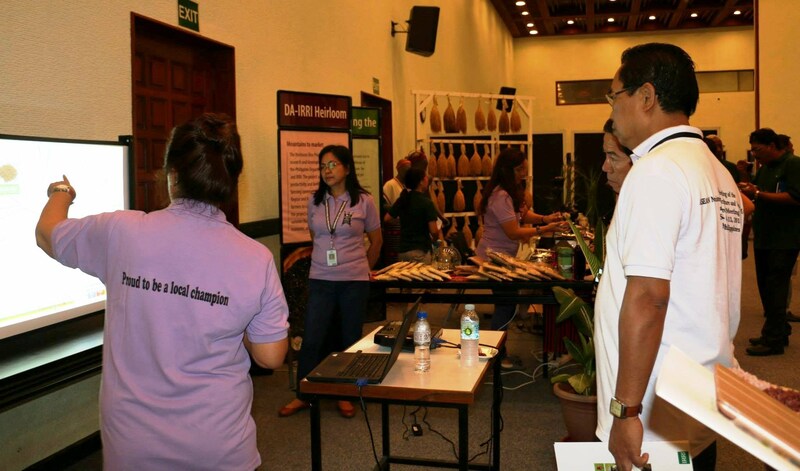 As part of showcasing IRRI's work, the Heirloom Rice Project was featured. Said dignitaries and their delegation members were able to taste featured varieties during the event. Farmers' varietal characterization prowess up! 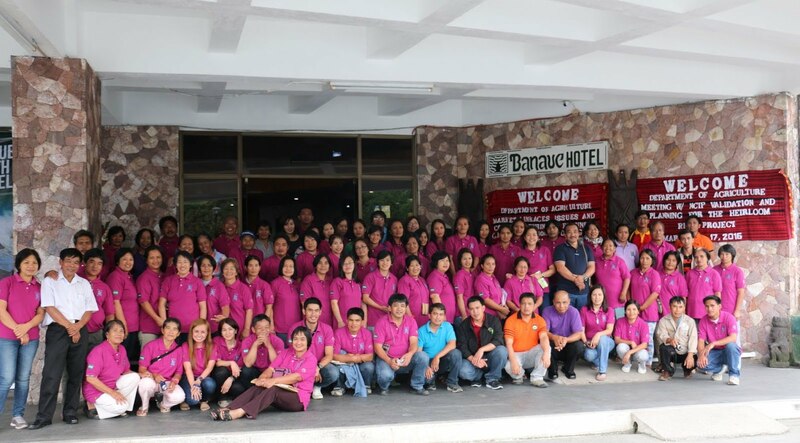 A training course on characterization of rice varieties was held at Banaue Hotel, Banaue Ifugao on 4-5 August 2015. In attendance were twenty-three Local Government Unit (LGU) technical staff and farmers who are partners of the DA-IRRI Heirloom Rice Project from Benguet, Ifugao, Kalinga and Mt. Province. The activity, which was coordinated by DA-CAR's Ms. Virgie Tapat and Ms. Josie Orlang, had Mr. Renato Reaño and Ms. Pauline Capistrano of IRRI as lecturers/facilitators. See more of them in action at our Facebook page. 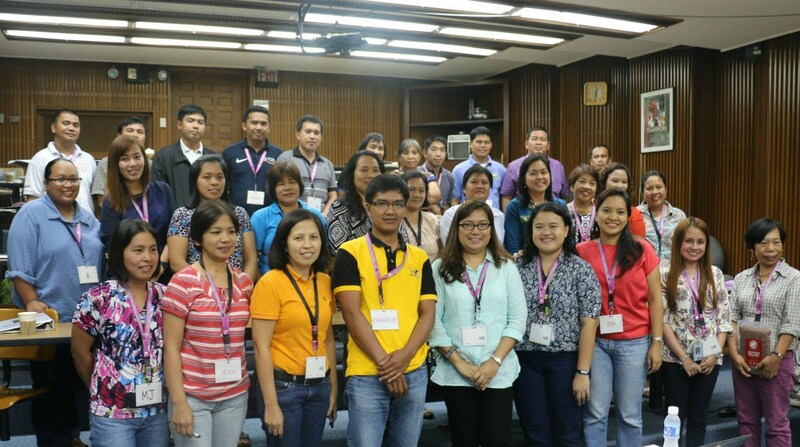 Local champions from Cordillera joined project staff and partners of the DA-IRRI Heirloom Rice Project in the Training-Workshop on Business Plan Preparation held at IRRI Headquarters, Los Baños, Laguna last July 22-23, 2015. 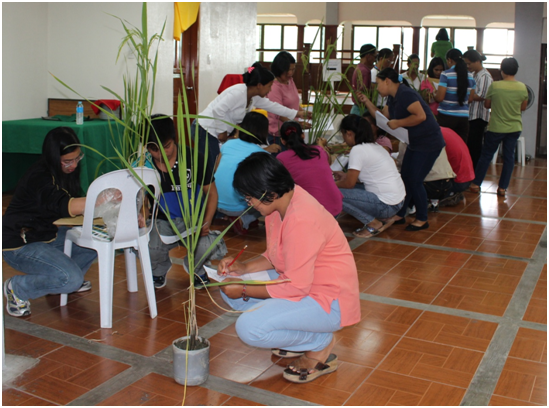 A total of 29 participants from IRRI, PhilRice, DA-RFOs in CAR and Region 12, along with representatives from State Universities and Colleges (SUCs) and Local Government Units (LGUs) in the provinces of Benguet, Ifugao, Kalinga, Mt. Province and Cotabato, attended the two-day "crash course" on the basics of business plan preparation, in anticipation of a series of similar trainings that will be rolled-out for beneficiary self-help groups of the project. More photos of the event on our Facebook page's album.